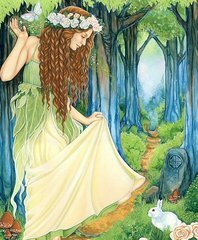 The Goddess Ostara is the German maiden Goddess who is celebrated at spring equinox and also the Anglo Saxon Goddess of the dawn named Eostra pronounced East-ra. The word oestrus (referring to an animal in heat) is also derived from Eostra. Eostra also means East and shining, related to the Greek Goddess Eos who is the Goddess of the dawn in their pantheon. 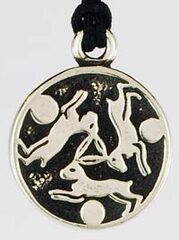 Ostara is the maiden Goddess of the growing light of spring; her consort is a white hare. Once, when spring was late in coming, a little girl found a bird close to death from the cold. The child prayed to Ostara for help for the bird. A rainbow bridge appeared and Ostara came, clothed in her red robe of warm, vibrant sunlight which melted the snows. Spring arrived. The little bird was wounded beyond repair, so Ostara changed it into a snow hare that brought rainbow coloured eggs. As a sign of spring, Ostara instructed the child to watch for the snow hare.